If your sights are still set on a castle, you should probably know that most kingdoms and their palaces are located in the countryside, far, far away from shopping, the latest fashion and a decent sushi bar. Unless, of course, you go to Helsinki. Glo Hotel Art, a 1903 Art Nouveau castle, is located right in the heart of Helsinki’s Design District, a 25-street area with upstart boutiques, oh-so-cool galleries and restaurants that put Downton Abby’s Mrs. Patmore to shame. Without having to call for your squire or your butler, you can easily prepare for a night out with Prince Charming at the nearby design showrooms, neighborhood jewelry makers and antique shops. You won’t even need your horse and carriage to get to the Esplanade, the famous green promenade with parks, free concerts and inspiring shops like Marimekko, Aarikka and Stockman’s. From Glo Hotel Art, it’s a pleasant ten-minute walk. Renovated in 2012, just in time for Helsinki’s year as World Design Capital, Glo Hotel Art combines the accouterments of a castle (well, maybe not a moat) with the cool factor of Finnish design. The stone lobby with its arches, stained glass windows, soft lighting and mysterious stairways evokes a cool Hogwarts vibe. Or would if Albus Dumbledore had admitted Art Nouveau muggle Alphonse Mucha to paint the walls. The 170 guest rooms, accessed down a series of long corridors, are contemporary, hip and even have free, fast WiFi, something you can’t say about your everyday garden variety castle. Although Madonna, while in Helsinki on her Sticky and Sweet Tour, stayed at Hotel Kamp on the Esplanade, Glo Hotel Art is one of six owned and operated by the same hotel group and treats all guests as if they were famous rock stars. Although they don’t hold up lighters or begin swaying together when guests walk in, they’re unwaveringly kind, courteous and don’t even seem to mind dumb questions. 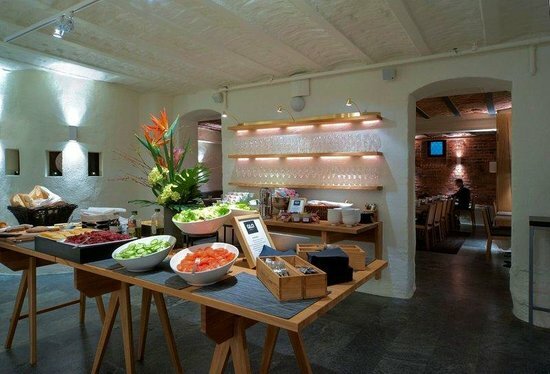 The breakfast (free to all Glo Art Hotel subjects, er guests) is fabulous, featuring Finnish lingonberries, cheese, pastries, breads and other local dishes. Even foamy lattes are thrown in for the asking. Glo Hotel Art, Lönnrotinkatu 29, 00180 HELSINKI, Finland, +358 10 3444 100.